A small watercraft used for transportation, fishing or recreation. Some boats are powered by sail, some by motor, and some by paddles or oars. A boat is small enough that it may be lifted onto a larger vessel. But submarines are also called boats. Fishing gear which traps fish. It may be nets, weirs, or traps like lobster traps. ), towed or dragged behind a vessel, or dropped around a school of fish. Gear used depends on the fish. Flat-bottomed open rowboat, characteristic of New England, whose planking run fore and aft, the length of the boat, with high sides, a V shaped raked or angled transom, and sharp, graceful sheer. Read More, bobbing the line up and down to attract the fish. Tubs in which a trawl line would be coiled. A dory could carry from two to four each with about 2000 feet of line., or six lines. Carried to the fishing grounds by schooner, fishermen left in dories and set their trawls, usually at night, to be brought in the next morning. During the day they baited the hooks and prepared the trawl, as well as splitting, salting, and stowing the previous day’s catch. Fishing remained self-limiting, powered by wind and muscle, with limited access to capital for building vessels. The hook and line fishery had the additional benefit of being selective and not disturbing the habitat. A long net buoyed up with floats and held down with weights or a weighted foot rope which hangs vertically in the water like a curtain, generally set near the surface of the ocean.. Drift nets can be miles long and are blamed for killing many marine mammals, including whales and dolphins. 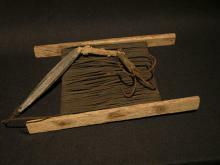 Net affixed to a handle which can be used to dip fish out of a trap. to scoop fish out of the seine net and into the boat. A fence-like structure placed in water and usually constructed of stakes and brush to form one or more enclosures into which fish are led and trapped. 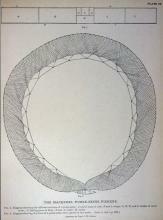 is a fixed net, built from shore to catch herring, mackerel, and salmon where there are large tides. A line of piles is driven out from the shore in a loop or heart-shape. Branches woven together fill the spaces between the piles. When fish enter the weir they swim in circles, not knowing how to get out. At low tide fishermen in small boats set a purse seine net within the weir and scoop fish into their boats. Weir fishing was the common method used to catch small herring for sardines in Washington County. 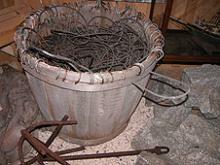 Lobster traps, using bait to attract lobsters, are today’s main form of fixed gear. Pairs fishing or pair trawling is done by two vessels, each of which tows half of a large trawl. 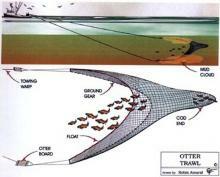 Otter boards are not needed to keep the net open and the net can be much larger than that towed by a single ship. Pair trawling can be bottom trawling or midwater, in the middle of the water column..
Motorized fishing vessels that towed large nets changed the fisheries; fish could now be actively pursued, eliminating the need for bait. After World War II, growing engine sizes, a revolution in electronics, and access to easy capital in the 1980s gave fishermen the potential to catch nearly everything. By 2004, only 4% of the weight and value of Maine's fish were groundfish. Click here to view images of groundfishing from PMM's photo collection. A fisherman’s boat is transportation to the fishing grounds, a fishing platform, a processing facility, and a temporary warehouse. The kind of boat depends on the location of the fishing grounds, the fishing gear, and the targeted fish. 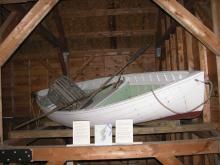 On the Maine coast a wherry is a transom-sterned rowing boat with a flat bottom board as a keel. A special variety was developed for the salmon fishery.. 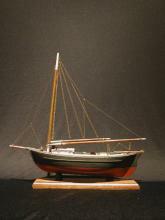 In early days small schooners were also used in the inshore fisheries. Offshore fishing required overnight trips from a few days to a few months. 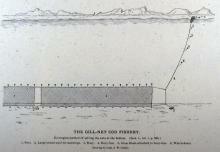 The schooner was the most popular design. Schooners changed over time, for a while emphasizing speed, and later emphasizing safety and carrying capacity. Before the Civil War, most fishing was done by hand line from a boat or vessel. Afterwards, new techniques included trawl line fishing and purse seine fishing for mackerel. 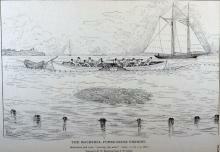 These techniques resulted in the use of larger schooners that could carry a number of dories on deck or tow a 38-foot seine boat. They also required increased capital that Mainers did not have and resulted in Maine’s declining offshore fishing fleet. In fishing, towing a net called a trawl along the bottom. In New England a boat that drags such a net is called both a dragger and a trawler. a large net . Dragging, which came to be called trawling, developed in Europe with sailing vessels and worked best with powerful engines. 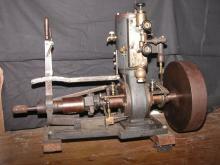 Steam trawlers needed lots of fuel and an engineer plus assistants, and were not popular in the United States. It was not until the 1920s that internal combustion engines large enough to efficiently tow nets made dory trawling from schooners obsolete. 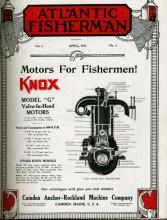 Fishermen made a rapid switch to engined boats, over a period of only a few years. In 1902, engined boats were not counted in New England fishery census reports. Two years later motor boats exceeded both sail and rowing boats in value. By 1908, the number of engined vessels exceeded sailing vessels; and of small boats, about half were engined and the rest mostly rowed.